When those that care join together with one voice there is unimaginable power. We can truly transform the world. Never be afraid to stand up and speak out. 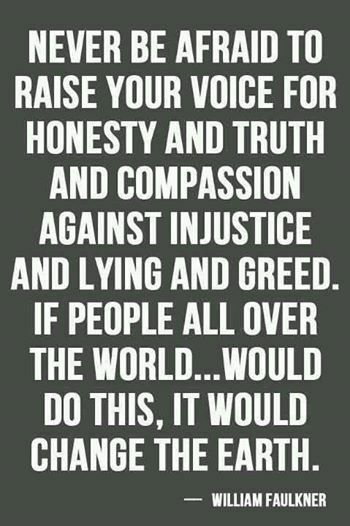 It’s the only way to overcome the lying and the greed. This entry was posted in Uncategorized and tagged caring, changing the world, compassion., fear, greede, honesty, injustice, lying, power, together, truth, voice, William Faulkner, world on May 11, 2018 by Ray Buchanan. I’ve spent the majority of my life working to end hunger. I know from personal experience that by working together we can change the world. It starts with speaking up for those who cannot be heard and standing up for those who cannot be seen. Faulkner says it far better than I can. Read his quote again. But, achieving a world of peace and justice, a world where honesty, truth and compassion holds sway, is possible. We can achieve a world where caring trumps greed, lying, and hatred. I want that world. Let’s stand up and speak out, and let us not be afraid to continue speaking out until we transform our world into a place where love truly trumps fear and hatred. 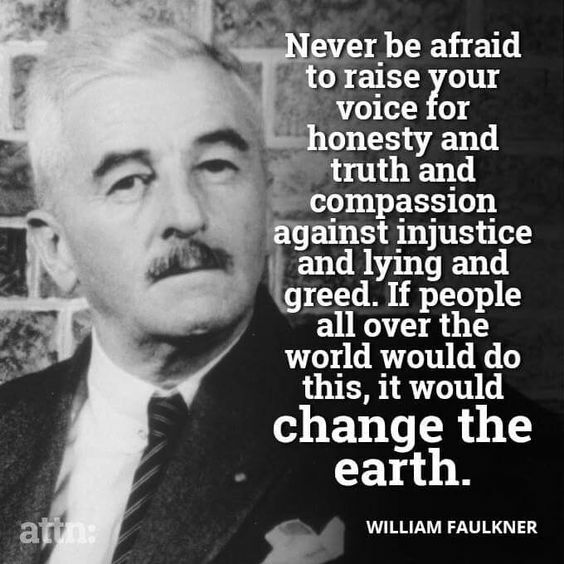 This entry was posted in Hunger & Poverty, Quotes and tagged changing the world, compassion., earth, fear hatred, greed, honesty, hunger, injustice, justice, lying, personal experience, quote, speaking out, truth, voice, William Faulkner, working together, world on December 16, 2017 by Ray Buchanan. What a different world we could have if more of us took Faulkner’s words to heart. I often find myself in tears over the open and even brazen acceptance of injustice, especially by those who claim to follow the Prince of Peace. Our love of money and all it can provide, our insatiable desire for more and bigger, has brought us to the place where we turn a blind eye to the evil of those in power and wink at wrong doing on a personal level. We live in a world where there’s no shame, and where honor can no longer be spelled, much less defined. Our greed and selfishness have even stripped us our ability for outrage. We now are part of a society where outrage over injustice is more unacceptable that the injustice that spawns it. Over 25,000 of our human family will die of hunger and hunger related caused today. In a world with far more than enough food for everyone of us, we will simply go about our business as usual. Our only outrage will be when we get cut off in traffic, the server get our lunch order wrong, or our our double-expresso latte gets cold. I honestly do not know how much longer I can bear it. This entry was posted in Hunger & Poverty, Quotes and tagged bankl, cash, desire, dishonor, greed, hunger, injustice, kudos, outrage, poverty, Prince of Peace, selfishness, shame, traffic, William Faulkner, wrong doing on April 18, 2015 by Ray Buchanan.